Last year my friend Lucy from Craftberrry Bush (who’s style I think is the bomb.com, I actually think I want to be her when I grow up) had the most fabulous idea for a Christmas wreath. She asked her readers if her idea was Brilliant or Crazy, and she got a big huge, both hands in the air BRILLIANT from my direction! 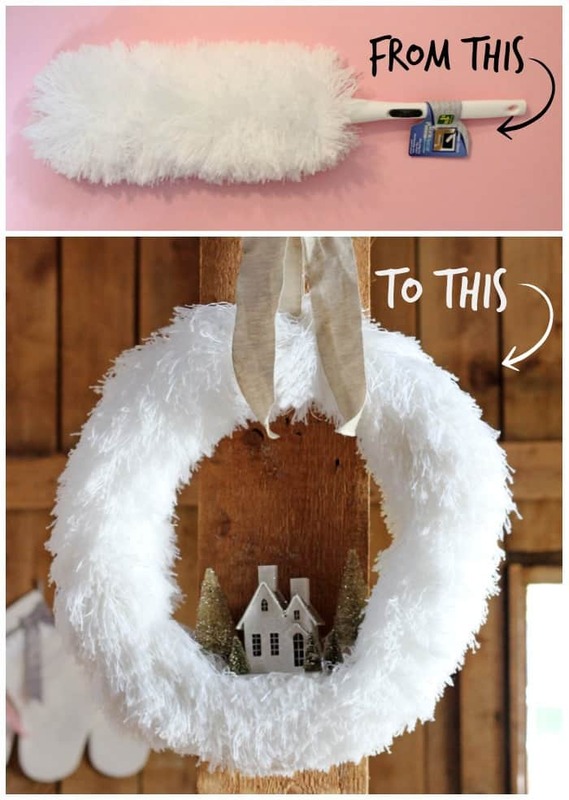 Lucy found fluffy dusters at the dollar store and recreated them into the most dreamy looking holiday wreath! You can read all about her duster wreath adventures here. If you want to make your own, slide over to Craftberry Bush to check out her great tutorial. The only part I did differently was I used an embroidery hoop as a wreath form to give it some extra stability. Then I added in a glittered village house, (the same as I used in my baking pan gallery wall village and my Shiny Christmas hutch), and some glittered Darice bottle brush trees . I hot glued everything directly to the dusters, and they are surprisingly stable (you could also make your own trees by following this handmade bottle brush tree tutorial). 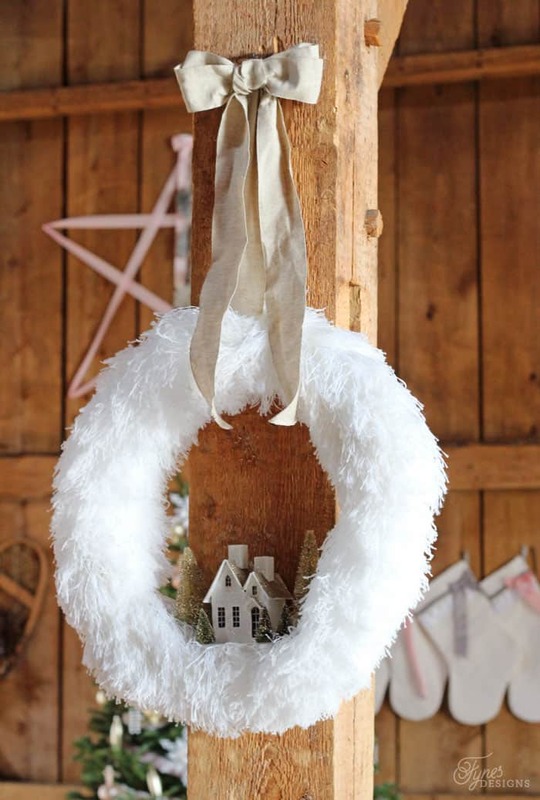 I love how fluffy this Christmas wreath is, kinda dreamy isn’t it?! 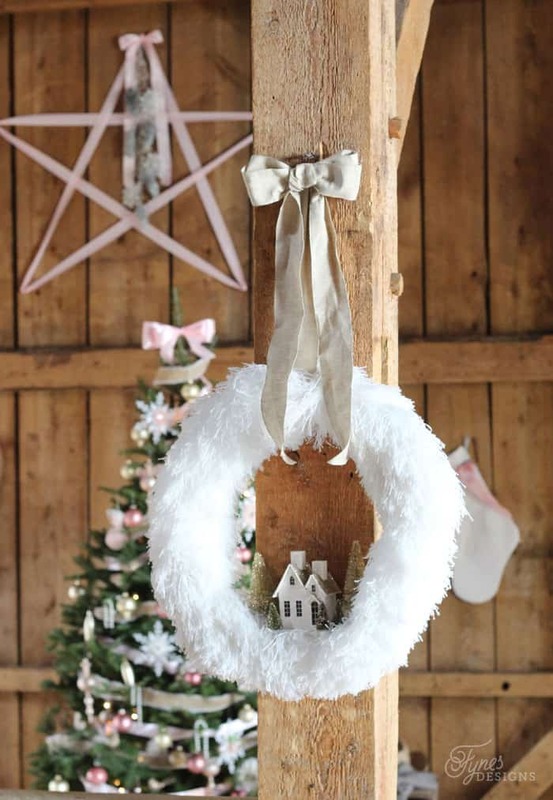 The May Arts Ribbon natural color burlap cotton blend bow adds a simple rustic touch to this Fluffy Village Christmas Wreath. This is actually my favourite ribbon of the season, you can see more of it in my Rustic Christmas scene. Can you spot another Christmas tree coming up? Can’t wait to share it with you. Big kudos to Craftberry Bush for coming up with this genius Christmas wreath idea, I’m quite sure this is a wreath craft anyone can tackle, plus it will cost you less than $10 to recreate! I hope you love this fluffy village Christmas Wreath as much as I do, Happy Christmas Creating! What a creative idea. 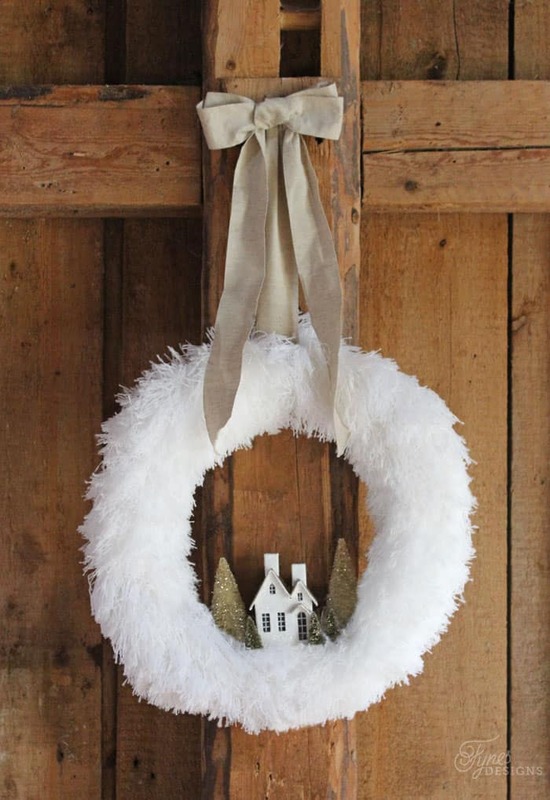 Love the fluffy village wreath! I will never look at feather dusters the same again. I love your wreath. On my way to the dollar store to get some dusters, cant wait to make one! Okay this is seriously genius! I have to have one! 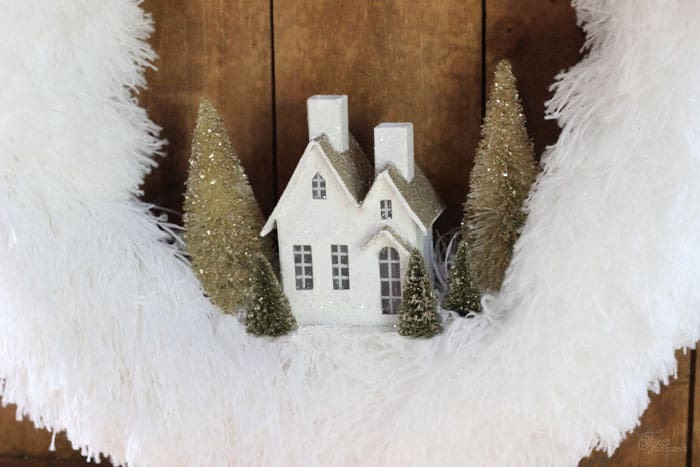 The little glitter houses are so cute and the fluffy wreath is to die for. Home run. What a great idea! I never would of thought of using a feather duster. Love it! Thanks for sharing at the party! Pinned…. This is really charming. I would love to feature this if you could have Craftastic Monday party button on your party page (I couldn’t find it if you have one) or anywhere else. Thanks for linking up to Craftastic Monday at Sew Can Do! This made me laugh. The kids will love this. Thanks for linking to What’d You Do This Weekend. I love this pretty wreath! I will be featuring this post on my blog at Tuesdays with a Twist, make sure you stop by and take a peek. 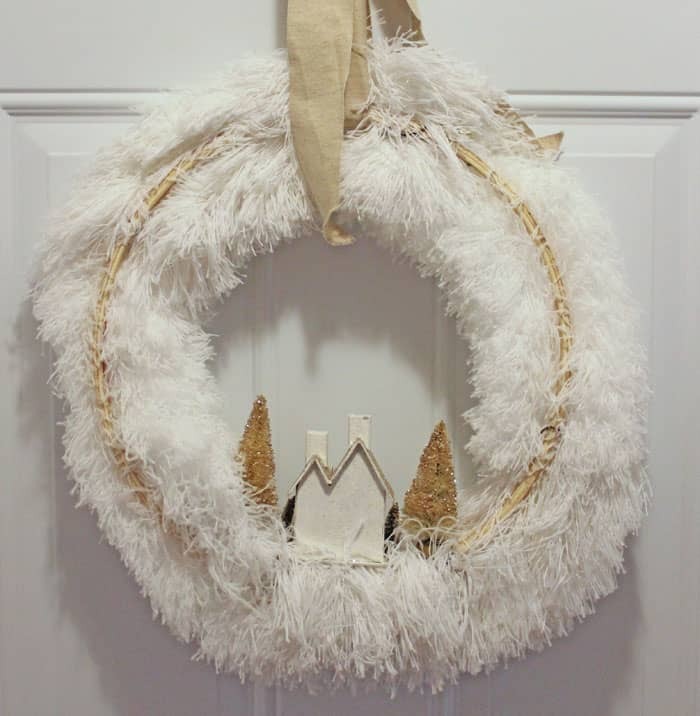 Love the fluffy village wreath! No time for making one this year, but I’m pinning it for the next one. Thanks for the inspiration!